AN EARTHQUAKE as powerful as the one that struck northern California last week could occur almost anywhere along the East Coast, experts say. And if it did, it would probably cause far more destruction than the West Coast quake. The chances of such an occurrence are much less in the East than on the West Coast. Geologic stresses in the East build up only a hundredth to a thousandth as fast as in California, and this means that big Eastern quakes are far less frequent. Scientists do not really know what the interval between them might be, nor are the deeper-lying geologic faults that cause them as accessible to study. So seismologists are at a loss to predict when or where they will strike. But they do know that a temblor with a magnitude estimated at 7 on the Richter scale – about the same magnitude as last week’s California quake – devastated Charleston, S.C., in 1886. And after more than a decade of study, they also know that geologic structures similar to those that caused the Charleston quake exist all along the Eastern Seaboard. If that happens, many experts agree, the impact will probably be much greater than in California. Easterners, unlike Californians, have paid very little attention to making buildings and other structures earthquake-proof or earthquake-resistant. ”We don’t have that mentality here on the East Coast,” said Robert Silman, a New York structural engineer whose firm has worked on 3,800 buildings in the metropolitan area. Moreover, buildings, highways, bridges, water and sewer systems and communications networks in the East are all older than in the West and consequently more vulnerable to damage. Even under normal conditions, for instance, water mains routinely rupture in New York City. On top of this, scientists say, an earthquake in the East can shake an area 100 times larger than a quake of the same magnitude in California. This is because the earth’s crust is older, colder and more brittle in the East and tends to transmit seismic energy more efficiently. ”If you had a magnitude 7 earthquake and you put it halfway between New York City and Boston,” Dr. Ebel said, ”you would have the potential of doing damage in both places,” not to mention cities like Hartford and Providence. Few studies have been done of Eastern cities’ vulnerability to earthquakes. But one, published last June in The Annals of the New York Academy of Sciences, calculated the effects on New York City of a magnitude 6 earthquake. That is one-tenth the magnitude of last week’s California quake, but about the same as the Whittier, Calif., quake two years ago. The study found that such an earthquake centered 17 miles southeast of City Hall, off Rockaway Beach, would cause $11 billion in damage to buildings and start 130 fires. By comparison, preliminary estimates place the damage in last week’s California disaster at $4 billion to $10 billion. If the quake’s epicenter were 11 miles southeast of City Hall, the study found, there would be about $18 billion in damage; if 5 miles, about $25 billion. No estimates on injuries or loss of life were made. But a magnitude 6 earthquake ”would probably be a disaster unparalleled in New York history,” wrote the authors of the study, Charles Scawthorn and Stephen K. Harris of EQE Engineering in San Francisco. The study was financed by the National Center for Earthquake Engineering Research at the State University of New York at Buffalo. The research and education center, supported by the National Science Foundation and New York State, was established in 1986 to help reduce damage and loss of life from earthquakes. The study’s postulated epicenter of 17 miles southeast of City Hall was the location of the strongest quake to strike New York since it has been settled, a magnitude 5 temblor on Aug. 10, 1884. That 1884 quake rattled bottles and crockery in Manhattan and frightened New Yorkers, but caused little damage. Seismologists say a quake of that order is likely to occur within 50 miles of New York City every 300 years. Quakes of magnitude 5 are not rare in the East. The major earthquake zone in the eastern half of the country is the central Mississippi Valley, where a huge underground rift causes frequent geologic dislocations and small temblors. The most powerful quake ever known to strike the United States occurred at New Madrid, Mo., in 1812. It was later estimated at magnitude 8.7 and was one of three quakes to strike that area in 1811-12, all of them stronger than magnitude 8. They were felt as far away as Washington, where they rattled chandeliers, Boston and Quebec. Because the New Madrid rift is so active, it has been well studied, and scientists have been able to come up with predictions for the central Mississippi valley, which includes St. Louis and Memphis. According to Dr. Russ, there is a 40 to 63 percent chance that a quake of magnitude 6 will strike that area between now and the year 2000, and an 86 to 97 percent chance that it will do so by 2035. The Federal geologists say there is a 1 percent chance or less of a quake greater than magnitude 7 by 2000, and a 4 percent chance or less by 2035. Elsewhere in the East, scientists are limited in their knowledge of probabilities partly because faults that could cause big earthquakes are buried deeper in the earth’s crust. In contrast to California, where the boundary between two major tectonic plates creates the San Andreas and related faults, the eastern United States lies in the middle of a major tectonic plate. Its faults are far less obvious, their activity far more subtle, and their slippage far slower. Any large earthquake would be ”vastly more serious” in the older cities of the East than in California, said Dr. Tsu T. Soong, a professor of civil engineering at the State University of New York at Buffalo who is a researcher in earthquake-mitigation technology at the National Center for Earthquake Engineering Research. First, he said, many buildings are simply older, and therefore weaker and more vulnerable to collapse. Second, there is no seismic construction code in most of the East as there is in California, where such codes have been in place for decades. Many brownstones, he said, constructed as they are of unreinforced masonry walls with wood joists between, ”would just go like a house of cards.” Unreinforced masonry, in fact, is the single most vulnerable structure, engineers say. Such buildings are abundant, even predominant, in many older cities. The Scawthorn-Harris study reviewed inventories of all buildings in Manhattan as of 1972 and found that 28,884, or more than half, were built of unreinforced masonry. Of those, 23,064 were three to five stories high. Buildings of reinforced masonry, reinforced concrete and steel would hold up much better, engineers say, and wooden structures are considered intrinsically tough in ordinary circumstances. The best performers, they say, would probably be skyscrapers built in the last 20 years. As Mr. Silman explained, they have been built to withstand high winds, and the same structural features that enable them to do so also help them resist an earthquake’s force. But even these new towers have not been provided with the seismic protections required in California and so are more vulnerable than similar structures on the West Coast. Buildings in New York are not generally constructed with such seismic protections as base-isolated structures, in which the building is allowed to shift with the ground movement; or with flexible frames that absorb and distribute energy through columns and beams so that floors can flex from side to side, or with reinforced frames that help resist distortion. ”If you’re trying to make a building ductile – able to absorb energy – we’re not geared to think that way,” said Mr. Silman. New York buildings also contain a lot of decorative stonework, which can be dislodged and turned into lethal missiles by an earthquake. In California, building codes strictly regulate such architectural details. Manhattan does, however, have at least one mitigating factor: ”We are blessed with this bedrock island,” said Mr. Silman. ”That should work to our benefit; we don’t have shifting soils. But there are plenty of places that are problem areas, particularly the shoreline areas,” where landfills make the ground soft and unstable. As scientists have learned more about geologic faults in the Northeast, the nation’s uniform building code – the basic, minimum code followed throughout the country – has been revised accordingly. Until recently, the code required newly constructed buildings in New York City to withstand at least 19 percent of the side-to-side seismic force that a comparable building in the seismically active areas of California must handle. Now the threshold has been raised to 25 percent. New York City, for the first time, is moving to adopt seismic standards as part of its own building code. Local and state building codes can and do go beyond the national code. Charles M. Smith Jr., the city Building Commissioner, last spring formed a committee of scientists, engineers, architects and government officials to recommend the changes. For the most part, neither New York nor any other Eastern city has done a detailed survey of just how individual buildings and other structures would be affected, and how or whether to modify them. In general, he said, the large suspension bridges, by their nature, ”are not susceptible to the magnitude of earthquake you’d expect in the East.” But the approaches and side spans of some of them might be, he said, and only a bridge-by-bridge analysis would tell. Nor, experts say, are some elevated highways in New York designed with the flexibility and ability to accommodate motion that would enable them to withstand a big temblor. The underground tunnels that carry travelers under the rivers into Manhattan, those that contain the subways and those that carry water, sewers and natural gas would all be vulnerable to rupture, engineers say. The Lincoln, Holland, PATH and Amtrak tunnels, for instance, go from bedrock in Manhattan to soft soil under the Hudson River to bedrock again in New Jersey, said Mark Carter, a partner in Raamot Associates, geotechnical engineers specializing in soils and foundations. Likewise, he said, subway tunnels between Manhattan and Queens go from hard rock to soft soil to hard rock on Roosevelt Island, to soft soil again and back to rock. The boundaries between soft soil and rock are points of weakness, he said. Even if it is possible to survey all major buildings and facilities to determine what corrections can be made, cities like New York would then face a major decision: Is it worth spending the money to modify buildings and other structures to cope with a quake that might or might not come in 100, or 200 300 years or more? Saudi Arabia and Iran are two regional powers in the Middle East, that act as two big divides in the region- as far as the religious ideologies are concerned. Both the states are backing their allies in their respective neighboring countries. This funding has led to many armed conflicts where these states are not direct participants though: Iran is largely being supported by Russia, while KSA is the American friend. The Iranian nuclear program is being perceived as threat by the Saudis, where Riyadh has reportedly considered the option of launching its own nuclear program, as its ‘enemy’ is pursuing it. KSA and Iran are divided by longstanding structural tensions. Each has inspirations for Islamic leadership and each possesse different visions of regional order. Tehran regards Riyadh as America’s proxy and a buffer against Iran’s rightful primacy in the Gulf, while Saudi Arabia worries about Iran’s asymmetric power and regional ambitions, especially its expanding influence in the post-Saddam Iraq and its alleged pursuit of nuclear weapon program. A particular concern in Riyadh is Iran’s ability to challenge the legitimacy of the al-Saud before regional and domestic audience by upstaging them on pan-Arab issues such as Palestine. The ties worsened after the Shia cleric Sheikh Baqir al Nimr was beheaded along with other 47 persons in Saudi Arabia. The Iranian response resulted in the attack on Saudi embassy in Tehran was attacked by violent mob and the furniture was set on fire. This led to Saudi Arabia severing the diplomatic ties with Iran. Several other countries like Bahrain and Sudan also cut diplomatic ties. This led to more tensions in the region. Pakistan’s civil-military leadership visited Saudi Arabia and then Tehran so that the tension between the two countries could be resolved and a middle way sorted out. The regional dynamics are changing as Iran is improving its ties with the West. After the nuclear deal has been signed Iran expects to receive billions of dollars that were confiscated by the world powers due to sanctions. Saudi Arabia on the other side is not at all happy with the proceeding of the Iranian nuclear deal, as it perceives this as a threat for the region. The rise of Iran would make the region insecure as the power dimensions would be disrupted. This rise would also threaten Israel, which is often being criticized by the Iranian leadership. Iran supports groups beyond its boundaries. Assad regime in Syria is constantly supported by Iran, where the latter is also assisting the Shia-led government in Iraq and helping them fight ISIS. Al-Quds brigade is operating in Iraq for quite some time. Hamas labeled as a terrorist organization is also being backed by Tehran. Moreover, this network of assistance extends all the way long to Lebanon and Yemen where they are supporting Hizbullah and Huthi tribe. Thus, the Iranian involvement is there in the entire Middle East. Similarly, Saudi Arabia also does not have its hands clean. KSA has reportedly been supporting al-Qaeda. Bin Laden belonged to Saudi Arabia. Saudis are reportedly supporting the ISIS with its network spread across the Middle East. Saudis had also helped Taliban in making roots in Afghanistan. They were funded by Saudis. They also financially assist the countries who follow their religious doctrine and political dictation. The US invasion of Iraq played a pivotal role in disturbing the balance of power in the Middle East. One of the most significant effects of the Iraq war is Iran’s seemingly unprecedented influence and freedom of action in regional affairs, presenting new strategic challenges for the US and allies. Although Middle ME governments and the US are in agreement about diagnosing Tehran’s activism as the war’s most alarming consequence, they disagree on how to respond. The conventional US view suggests that a new Arab consensus has been prompted to neutralize and counter Tehran’s rising influence across the region in Gaza, the Gulf, Iraq, and Lebanon. Parallels to Cold War containment are clear. Indeed, whether consciously or unwittingly, US policy has been replicating features of the Cold War model by trying to build a “moderate” Sunni Arab front to bolster US efforts to counter Iranian influence. Despite signals that the Obama administration intends to expand US engagement with Iran, the foundations of containment are deeply rooted and engender bipartisan backing from Congress. Even if the Obama administration desires to shift US policy toward Iran, containment policies will be difficult to overturn quickly; if engagement with Iran fails, reliance on containment will only increase. The containment strategy seems to be founded on what many US officials and analysts perceive as one of the Iraq war’s few silver linings: the removal of Saddam Hussein as the “eastern flank” of the Arab world laid bare Iran’s longstanding malevolence towards the region and spurred Arab states towards greater activism in line with US strategy. Yet, this premise is dangerously flawed. It is the result of misreading local politics and the nuanced ways Arab states are managing and, in some cases, exploiting the challenge from Iran and the broader effects of Iraq war. The events over the past two years in the Gulf, Egypt, Jordan and Lebanon suggest a different picture. Arab states are certainly alarmed about growing Iranian influence in the region, particularly about alleged Iranian activities within their own states. Gulf states with Shia population, like Bahrain, feel especially vulnerable to Iranian intervention. Moreover, Iranian support for Hamas during crises such as the Gaza war in 2008–2009 burnishes Iran’s pro-Palestinian credentials among Arab publics and challenges the authority and legitimacy of pro-Western Arab states such as Egypt and Jordan. This alarm, however, does not translate into unequivocal balancing against Iran or a wholesale embrace of US regional containment policy. Instead, Arab states are more likely to blend confrontational policies towards Tehran with elements of conciliation, engagement and accommodation, thus hedging against sudden swings in the US policy towards Iran while maintaining deeply rooted economic and cultural ties with their neighbour to the east. For some, the threat of US military action against Iran is as worrisome as a potential nuclear threat from Iran itself. There is also little evidence for broad-based support for a single Arab “balancer” against Iran, despite the best efforts of Saudi Arabia and its assertive new diplomacy. Indeed, for some observers, the consequences of Riyadh’s response to Tehran are a cause for greater concern than the Iranian challenge. Finally, some Arab leaders have skillfully exploited Washington’s preoccupation with Iran and its wariness of democracy in the region to further entrench their authoritarian rule and defer much-needed internal reforms. In this atmosphere, Washington needs to be clear about its priorities if it wants to get anything done with Riyadh. The United States should cooperate on issues where common interests are clear, such as stabilizing Yemen, containing Iran’s regional power, destroying al-Qaeda and its regional affiliates. It should encourage the Saudis to reconsider policies such as isolating the Iraqi government and stoking Shia-Sunni animosities that could harm both US and Saudi interests in the future by making clear that overall cooperation on security issues requires these steps. Finally, US policymakers should make clear that nuclear proliferation by Saudi Arabia would put at risk any future collaboration on security issues. As we predicted months ago, the IMF officially green-lighted the acceptance of China’s currency – the Yuan – into the IMF’s foreign exchange basket. According to Reuters, this move paves the way for the IMF to place the yuan on a par with the U.S. dollar. This is the latest in a series of global developments that threatens to eliminate the U.S. dollar as the world’s reserve currency. Experts predict this announcement will trigger one of the most profound transfers of wealth in our lifetime. So if you want to protect your savings & retirement, you better get your money out of U.S. dollar investments and into the one asset class that rises as currencies collapse. The International Monetary Fund, or IMF, is one of the most secretive and powerful organizations in the world. They monitor the financial health of more than 185 countries. They establish global money rules and provide “bail-out” assistance to bankrupt nations. Some are warning that any move by the IMF to supplant the U.S. dollar could be catastrophic to American investments. And now, the IMF has made the first move. As reported by The Wall Street Journal, the IMF officially green-lighted the acceptance of China’s currency – the Yuan – into the IMF’s foreign exchange basket. This marks the first time in history the IMF has expanded the number of currencies in the foreign exchange basket. This means that the Chinese currency will now become a viable global alternative to the U.S. dollar. Dr. Sjuggerud says if you own any U.S. “paper” assets—and that includes stocks, bonds, or just cash in a bank account–you should be aware of what’s about to happen and know how to prepare. A number of experts believe a recent spike in gold and silver prices is a direct result of the IMF’s action. Precious metals notoriously rise when the U.S. dollar falls. For the last 600 years, there have been six different global reserve currencies controlled by world superpowers. The latest – the U.S. dollar – has dominated world currency for over 80 years. The alarming fact is, global reserve currencies have collapsed every 80-90 years for the last six centuries! What does this mean for America and the dominance of the U.S. dollar? Based on recent evidence and long-standing historical trends, experts predict the imminent collapse of the U.S. dollar! What’s more alarming? Many Americans aren’t yet doing the one thing that will save their savings & retirement from U.S. dollar collapse. It’s obvious why experts say that the U.S. dollar’s days as the world’s reserve currency are coming to a climactic end. “Fiat” currency is paper currency backed by nothing tangible. As opposed to “sound money” which is was backed by gold or some other valuable commodity, a fiat currency is backed by nothing more than faith in the government. The U.S. dollar has been a fiat currency since Nixon closed the gold window in 1971 in what was the greatest heist in American history. The scary fact is, the average life span of a fiat currency is 40 years, and the U.S. dollar has now exceeded 40 years as a fiat currency! Prior to 1933 and for well over 100 years, the dollar was backed by gold, and $20 bought you an ounce of gold. But after the government stole all U.S. citizens’ gold in 1933 for a $20 paper certificate, gold was revalued at $35 U.S.D., meaning the dollar was devalued by 43% overnight and all foreign and domestic holders of dollars were effectively robbed. After Nixon closed the gold window completely in 1971, it took $67 to buy an ounce of gold, devaluing the U.S. dollar by 50% again. Today, it takes well over a thousand U.S. dollars to buy that same ounce of gold. Why? Because the U.S. dollar is now nothing more than a fast-declining Federal Reserve note backed by a corrupt government that is saddled with $18 trillion in unpayable debt — growing by $10 million per minute! North Korea’s claim that it detonated a hydrogen bomb during an apparent nuclear-weapons test on January 6 were widely dismissed by experts and the US government as well. But it turns out that Pyongyang might have tested components from a hydrogen bomb after all. According to CNN, inconclusive sampling of air near the test site by US spy aircraft, along with the unusual depth at which the test is believed to have occurred, have led some US officials to suspect that North Korea actually did test elements of a hydrogen device. Seismic information indicates that North Korea tested a weapon with a comparable explosive yield to the nuclear device the country detonated during its last previous test in 2013 — a 10-kiloton bomb that created a fireball one-fifth of a mile wide. After the January 6 test, numerous arms-control experts said it was highly unlikely that North Korea had tested a hydrogen bomb, though possible it had tested a more typical fission-based atomic weapon “boosted” with hydrogen isotopes for increased yield. Even a failed test of hydrogen-bomb components could signal an alarming shift in North Korea’s weapons capabilities. A hydrogen bomb, aka a thermonuclear weapon, uses a plutonium- or uranium-based reaction to heat hydrogen isotopes, creating a kind of nuclear-feedback loop with the potential to dramatically boost the amount of energy that reaction ends up releasing. A thermonuclear weapon is more complicated and destructive than a typical atomic bomb. As Alex Wellerstein, a nuclear historian at the Steven Institute of Technology and creator of Nuke Map, told Business Insider on January 6, a country that’s mastered thermonuclear-weapons design suddenly has a number of possible options open to it. The so-called neutron bomb, or “enhanced radiation,” weapon isn’t all that hard to develop once a country has mastered more basic hydrogen-bomb technology. Map locating North Korea’s nuclear facilities. North Korea would still face the technical hurdle of miniaturizing a hydrogen device for delivery by ballistic missile. The US wasn’t able to construct a functioning neutron bomb of any size or weight without extensive testing, and North Korea may not have the testing data or carried out the trial-and-error process needed to actually build a functioning hydrogen device. But if North Korea really did test hydrogen-bomb components, it could signal an interest in eventually developing far more destructive weaponry — bombs of horrifically high yield whose development might not remain outside Pyongyang’s technological grasp for long. The Bulletin of The Atomic Scientists, a nonprofit journal that discusses science and policy, recently announced on campus that the probability that a nuclear catastrophe will occur in the near future is high. Their “Doomsday Clock,” a symbolic clock which predicts when humanity will destroy itself, remains unchanged in the latest update, a mere three minutes from midnight — the hour at which catastrophe strikes. Stanford’s Center for International Security and Cooperation reported this assessment, which was revealed at a press conference on Tuesday led by two Stanford experts and California governor Jerry Brown. William J. Perry, former Secretary of Defense and FSI Senior Fellow, pointed to recent efforts by the U.S and Russia to modernize their nuclear weapons and stated that he feared that the risk of a nuclear disaster today was even greater than during the Cold War and that government policy did not yet reflect this threat. Perry exhorted President Obama to remain committed to nuclear disarmament as he enters his last year in office. George P. Schultz, former Secretary of State and Hoover Institute Senior Fellow, also stressed the need for American leadership and engagement on the international stage. While the Doomsday Clock initially focused on the risk of a nuclear catastrophe, in recent years it has also reflected the threat of anthropogenic climate change. Governor Brown said that the two issues are innately tied and was discouraged by the lack of government action. 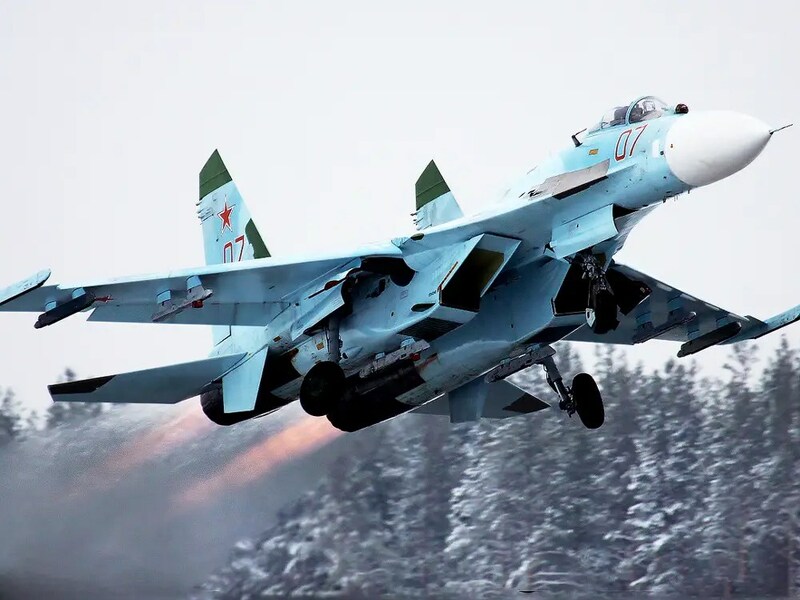 A Russian Su-27 jet fighter came within 20 feet of a US RC-135 reconnaissance aircraft over the Black Sea on Monday in Moscow’s latest military provocation involving dangerous aerial encounters. Defense officials said the Su-27 flew alongside the RC-135, an electronic intelligence-gathering aircraft, and then performed what they said was an aggressive banking turn away from the intelligence jet. The thrust from the Su-27 “disturbed the controllability” of the RC-135, said one official familiar with details of the incident. A second official said the reconnaissance aircraft was flying 30 miles from the coast—well within international airspace and far away from any Russian territory—at the time of the encounter. The Pentagon announced Thursday that it has concluded a flight safety memorandum with Russia after holding a video conference with Russian Defense Ministry officials. The areas of discussion included air safety over the skies in Syria as well as “the means to avoid accidents and unintended confrontation between coalition and Russian forces whenever the two sides operate in close proximity,” Pentagon spokesman Peter Cook said in a statement. 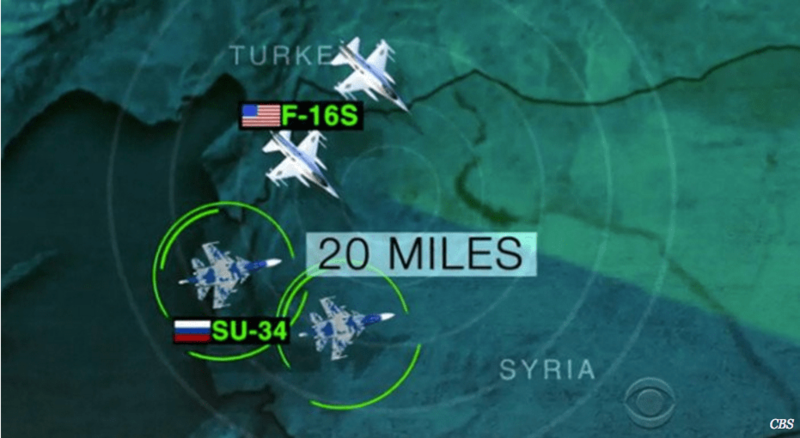 CBSA map showing just how close Russian and US war planes are in near Syria. The statement made no mention of Monday’s dangerous aerial encounter. The Black Sea encounter was the latest in a series of aggressive Russian military activities aimed coercing or harassing US military aircraft and ships in both Europe and Asia. The provocations are not limited to US forces. On Tuesday, Japan’s Defense Ministry revealed that Japanese interceptor jets were scrambled to chase two Russian Tu-95 Bear bombers that approached the northern end of Japan and flew just outside that country’s airspace in maneuvers described by analysts as unusually close. 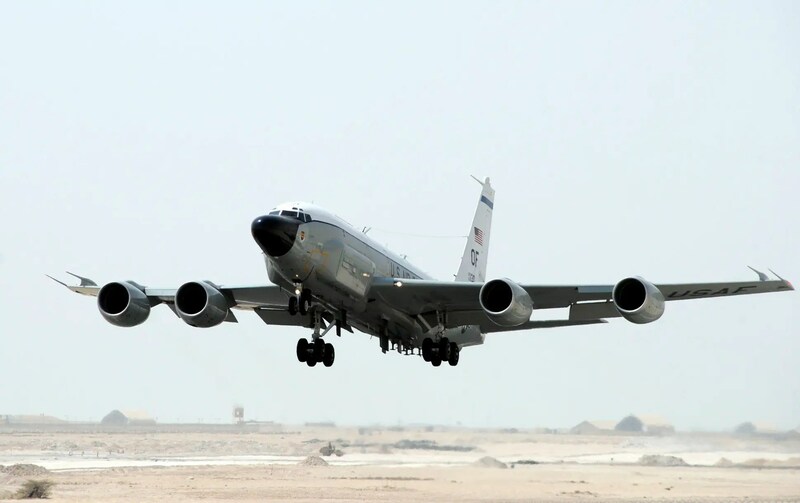 Other incidents included a similar near-collision between a Russian fighter and RC-135, a militarized Boeing 707, over the Black Sea on May 30. Around the same time, a Russian Su-24 jet buzzed the destroyer USS Ross in the Black Sea near occupied Crimea. 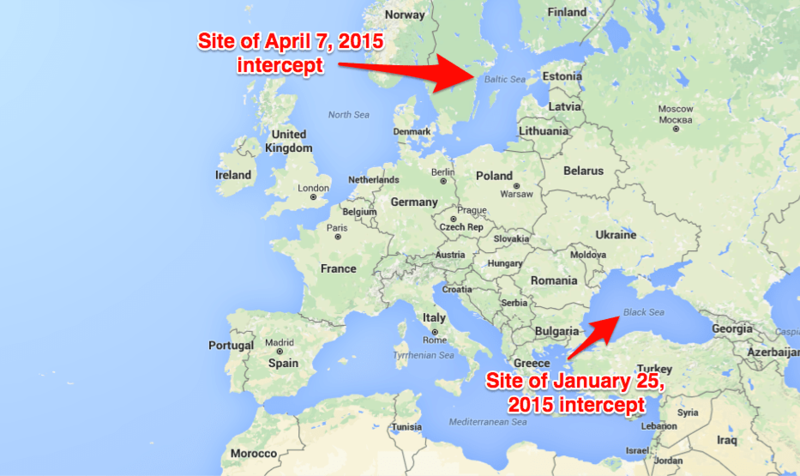 Earlier, on April 7, another Su-27 flew within 20 feet of an RC-135, this time over the Baltic Sea. The RC-135 intercept over the Black Sea took place around the same time as a Russian Su-24 jet interceptor buzzed the destroyer USS Ross in the Black Sea, near occupied Crimea. Navy footage showed the jet made several low-level passes over the Ross. In October, two Russian Tu-142 bombers made low passes near the aircraft carrier USS Reagan as it sailed in the Sea of Japan near the Korean peninsula. Navy F-18 jets were scrambled to intercept the bombers during that incident. The AviationistThe RC-135 spy plane. And last July 4, two Tu-95 nuclear-capable bombers flew within 40 miles of the California coast and communicated a “happy birthday” message to intercepting US pilots. That incident took place the same day President Obama held a telephone conference with Russian leader Vladimir Putin. Russian Tu-95 bombers also circumnavigated Guam in December, for the second time in two months. Guam is the US military’s major hub and a key facility in the American military rebalance to Asia. “Much of what Russia is doing today is aimed at generating fear of Russian military power and the possibility of war,” said former Pentagon Russia expert Mark Schneider. 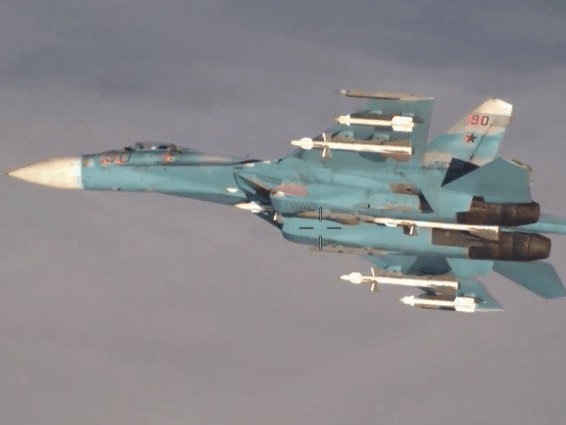 AirlinersRussia likes to use their air force to intimidate other nations. Adm. Cecil Haney, commander of the US Strategic Command said Russian military activities, including aircraft flights, are an increasing concern as Moscow seeks to reemerge as a world power. Haney voiced concerns about Russian nuclear-capable bomber flights around the world, and large-scale ground forces nuclear exercises, along with vocal statements threatening the use of nuclear weapons. Russia has stepped up aggressive military activities in response to NATO’s deployment of forces closer to Russian borders following Moscow’s military annexation of Ukraine’s Crimea and continuing covert military destabilization of eastern Ukraine. NATO has increased its force posture with additional military exercises, troop deployments and increased intelligence-gathering to support NATO allies that are threatened by Russian military revanchism. 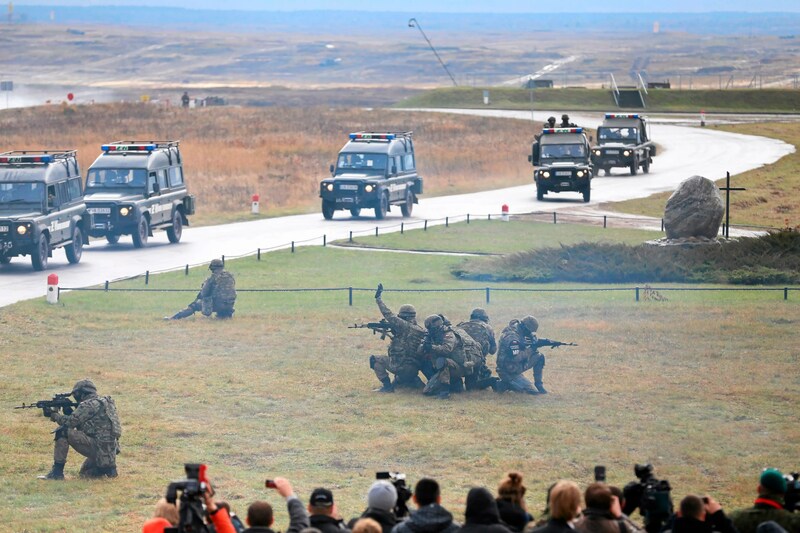 Agencja Gazeta/ReutersNATO has increased joint training exercises in response to Russian aggression. Russia announced a new military strategy in December that increases the country’s reliance on nuclear forces over conventional troops and weapons. Russia also is expected to announce a new military doctrine, a senior Russian commander announced on Tuesday. Maj. Gen. Sergey Chvarkov, deputy chief of the general staff academy said the United States is seeking to weaken Russia and is creating new national security threats to Moscow. “At the foundation of the negative development of the international situation lie the USA’s actions, which in striving for global hegemony intentionally forms global instability to weaken strategic opponents, primarily Russia, creating national security threats to our country,” Chvarkov said, according to the state-run RIA Novosti news agency. Western policies are fomenting global and internal conflicts that have produced the flood of refugees in Europe, Chvarkov said. He added that the West is waging “information war” on Russia. Although New York’s modern skyscrapers are less likely to be damaged in an earthquake than shorter structures, a new study suggests the East Coast is more vulnerable than previously thought. The new findings will help alter building codes. July 18, 2014 10:03 a.m. The U.S. Geological Survey had good and bad news for New Yorkers on Thursday. In releasing its latest set of seismic maps the agency said earthquakes are a slightly lower hazard for New York City’s skyscrapers than previously thought, but on the other hand noted that the East Coast may be able to produce larger, more dangerous earthquakes than previous assessments have indicated. The 2014 maps were created with input from hundreds of experts from across the country and are based on much stronger data than the 2008 maps, said Mark Petersen, chief of the USGS National Seismic Hazard Mapping Project. The bottom line for the nation’s largest city is that the area is at a slightly lower risk for the types of slow-shaking earthquakes that are especially damaging to tall spires of which New York has more than most places, but the city is still at high risk due to its population density and aging structures, said Mr. Petersen. Just because they’re infrequent doesn’t mean that large and potentially disastrous earthquakes can’t occur in the area. The new maps put the largest expected magnitude at 8, significantly higher than the 2008 peak of 7.7 on a logarithmic scale. The scientific understanding of East Coast earthquakes has expanded in recent years thanks to a magnitude 5.8 earthquake in Virginia in 2011 that was felt by tens of millions of people across the eastern U.S. New data compiled by the nuclear power industry has also helped experts understand quakes. Oddly enough, it’s not the modern tall towers that are most at risk. Those buildings become like inverted pendulums in the high frequency shakes that are more common on the East Coast than in the West. But the city’s old eight- and 10-story masonry structures could suffer in a large quake, said Mr. Lerner-Lam. Engineers use maps like those released on Thursday to evaluate the minimum structural requirements at building sites, he said. The risk of an earthquake has to be determined over the building’s life span, not year-to-year. The new USGS maps will feed into the city’s building-code review process, said a spokesman for the New York City Department of Buildings. Design provisions based on the maps are incorporated into a standard by the American Society of Civil Engineers, which is then adopted by the International Building Code and local jurisdictions like New York City. New York’s current provisions are based on the 2010 standards, but a new edition based on the just-released 2014 maps is due around 2016, he said. “The standards for seismic safety in building codes are directly based upon USGS assessments of potential ground shaking from earthquakes, and have been for years,” said Jim Harris, a member and former chair of the Provisions Update Committee of the Building Seismic Safety Council, in a statement. The seismic hazard model also feeds into risk assessment and insurance policies, according to Nilesh Shome, senior director of Risk Management Solutions, the largest insurance modeler in the industry. The new maps will help the insurance industry as a whole price earthquake insurance and manage catastrophic risk, said Mr. Shome. The industry collects more than $2.5 billion in premiums for earthquake insurance each year and underwrites more than $10 trillion in building risk, he said. SWEDEN PREPARES TROOPS FOR WORLD WAR 3 — COULD IT HAPPEN SOONER THAN WE THOUGHT? Sweden was politically neutral during the World War II — even as its bordering countries were invaded, fell under, or accepted the Third Reich or Soviet Russia. The reason that the relatively peaceful nation will soon get involved with a potentially crippling world war is based on a statement given by Swedish General Anders Brännström. Breitbart reports that the general informed his troops “to expect to be fighting a war in Europe against skilled opponents within a few years,” via an internal army document. Furthermore, Brännström’s documents were also given to civilians and politicians in case World War 3 does indeed break loose. And regarding Sweden’s military budget projected for 2016 to 2020, he noted that more money should be spent on military expenditures. He also seemed to be adamant about his military performing well. To actively prepare for World War 3, Sweden will engage in maneuvers that will focus on its army’s ability to fight and survive a “winter war,” as the general put it. Aftonbladet (best-selling tabloid in Sweden) reports that Brännström’s warnings are stemmed from fears of ISIS capitalizing off of Europe’s deteriorating security as a whole. The spreading instability from Ukraine could lead to conflict as well. “One can draw parallels with the 1930s. A great uncertainty and [political] dynamics which then led to a great war. That time we managed to keep out. But it is not at all certain we could succeed this time,” he said. Breitbart also reports that the Swedish general is not alone in his fears as he noted that his senior colleagues all think that World War 3 is imminent. “This is a serious position shared by most. This is a completely different situation to the one we had ten years ago,” he added. The Inquisitr already reported on speculations of World War 3 happening in the near future last year. Sweden’s neighbor Finland made its own World War 3 predictions when the Finnish Defense Ministry began preparing its army to defend against Vladimir Putin’s threats. And the U.S. Air Force even gave support by sending B-52 bombers to Sweden — the very country making the World War 3 claims now. The gesture was precautionary, which is evident now, but nevertheless the northern countries have been cautious of such threat for a while now. Do you think that Sweden and the rest of the world will soon be faced with World War 3? How do you think the U.S. will get involved if they do? The U.S. must do more to track and block companies that could be aiding the collaboration between Iran and North Korea on nuclear and military programs, according to a report published in Washington on Thursday that claims the links between the two isolated nations is deeper than commonly recognized. The report by the Foundation for Defense of Democracies, a Washington-based think tank, was released just weeks after Pyongyang claimed to have carried out a successful test of a hydrogen bomb and international sanctions on Iran are being lifted under the Obama administration-backed nuclear accord with Tehran. While the foundation’s report notes there is “no proof” of explicit Tehran-Pyongyang nuclear cooperation, there remain a host of unanswered questions and fears among some analysts that Iran is “outsourcing aspects of its nuclear weapons program” to North Korea. “Signs of military and scientific cooperation between Iran and North Korea suggest that Pyongyang could have been involved in Tehran’s nuclear and ballistic-missile program, and that state-run trading companies may have assisted in critical aspects of Iran’s illicit nuclear-related activities,” the foundation’s report notes, saying that put more pressure on the Obama administration to track the suspected linkages. Debate over the extent of collusion between the two is heated, although evidence of collaboration has piled up for years. One of the more significant developments came in November 2010 with the leaking of a classified U.S. government cable written 10 months earlier that revealed that American intelligence officials believed Iran had obtained 19 advanced missiles from North Korea. CIA Director John O. Brennan last fall acknowledged that his agency was watching to see if Tehran would attempt to continue its clandestine nuclear program through a third nation — even as Iranian officials were pledging to disclose their own activities to U.N. inspectors as part of the agreement. Intelligence officials asserted afterward that Mr. Brennan was speaking only generally, not specifically, about a potential Iranian-North Korean connection. But his comments coincided with claims by some outside the government that the Iran nuclear deal failed to address such issues. It’s the prospect of collaboration with North Korea that has triggered the most unease on Capitol Hill. But fears of such coordination have surged anew in the wake of two ballistic missile tests carried out by Iran this fall andPyongyang’s more recent claim to have test-detonated a miniaturized hydrogen bomb. The Senate Foreign Relations Committee on Thursday passed a bill, already cleared by the House, that would expand the president’s power to level sanctions against anyone found to be facilitating North Korea’s nuclear weapons program. Thursday’s report by the Foundation for Defense of Democracies challenges the administration’s hope that the Iran nuclear deal would moderate Tehran’s foreign policy and hostility to U.S. interests. At the same time, the authors acknowledge that assertions of nuclear collaboration between Pyongyang and Tehran are based mainly on evidence of ballistic missile technology transfers between the two over the past three decades. “Hard evidence of active nuclear weapons development and production is lacking,” the report states. “However, the activities of the Shahid Hemmat Industrial Group (SHIG), for example, suggest a certain depth to [North Korean-Iranian] ballistic missile collaboration. The report also points to companies already sanctioned by the U.S. and the European Union. A fight now underway over newly-designed US nuclear weapons highlights how far the Obama administration has strayed from its commitment to build a nuclear-free world. Overall, the Obama administration’s nuclear “modernization” program – including not only redesigned nuclear weapons, but new nuclear bombers, submarines, land-based missiles, weapons labs, and production plants – is estimated to cost as much as$1 trillion over the next thirty years. Andrew C. Weber, a former assistant secretary of defense and former director of the interagency body that oversees America’s nuclear arsenal, has criticized it as “unaffordable and unneeded.” After all, the US government already has an estimated 7,200 nuclear weapons. The nuclear weapons modernization program is particularly startling when set against President Obama’s April 2009 pledge to build a nuclear weapons-free world. Although this public commitment played a large part in his receipt of the Nobel Peace Prize that year, in succeeding years the administration’s action on this front declined precipitously. It did manage to secure a strategic arms reduction treaty(New START) with Russia in 2010 and issue a pledge that same year that the US government would “not develop new nuclear warheads.” But, despite promises to bring the 1996 Comprehensive Test Ban Treaty to the Senate for ratification and to secure further nuclear arms agreements with Russia, nuclear disarmament efforts ground to a halt. Instead, plans for “nuclear modernization” began. The president’s 2016 State of the Union address contained not a word about nuclear disarmament, much less a nuclear weapons-free world. Two formidable obstacles derailed the administration’s nuclear disarmament policy. At home, powerful forces moved decisively to perpetuate the US nuclear weapons program: military contractors, the weapons labs, top military officers, and, especially, the Republican Party. Republican support for disarmament treaties was crucial, for a two-thirds vote of the US Senate was required to ratify them. Thus, when the Republicans abandoned the nuclear arms control and disarmamentapproach of past GOP presidents and ferociously attacked the Obama administration for “weakness” or worse, the administration beat an ignominious retreat. To attract the backing of Republicans for the New START Treaty, it promised an upgraded US nuclear weapons program. Despite these roadblocks, the Obama administration could renew the nuclear disarmament process. Developing better relations with Russia, for example by scrapping NATO’s provocative expansion plan, could smooth the path toward a Russian-American nuclear disarmament agreement. And this, in turn, would soften the objections of the lesser nuclear powers to reducing their own nuclear arsenals. If Republican opposition threatened ratification of a disarmament treaty, it could be bypassed through an informal US-Russian agreement for parallel weapons reductions. Moreover, even without a bilateral agreement, the US government could simply scrap large portions of its nuclear arsenal, as well as plans for modernization. Does a country really need thousands of nuclear weapons to deter a nuclear attack? Britain possesses only 215. And the vast majority of the world’s nations don’t possess any.